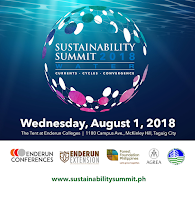 Sustainability Summit 2018 will take place on August 1 at the Tent of Enderun Colleges, Fort Bonifacio, Taguig City, the Phillipines. 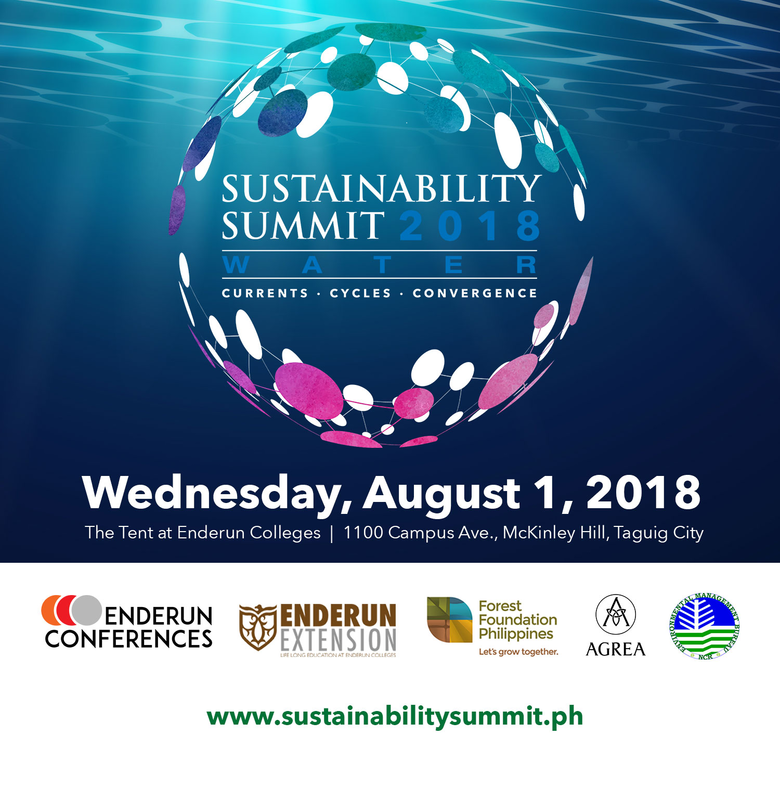 Enderun will tackle Water in its third Sustainability Summit. Over 200 delegates from top corporations, business leaders, government, NGO professionals and the academe will attend the one-day event — to identify and discuss the more pressing issues, trends, synergies and challenges and ideate achievable and lasting solutions for one of the world’s more critical sustainability concerns: WATER. Water is defined as a resource, a risk, a livelihood, a right. Complex and changing, water is an interweaving force in human society. From energy and infrastructure to agriculture and public health, almost all industries and sectors interact with water in some capacity. Yet, as with any natural element, water poses risks and challenges that become more severe with extreme weather changes, rising populations, and increasing urbanization (just to name a few). The goal of Sustainability Summit 2018 is to take the same multidimensional approach as in the previous summits to identify and discuss the more pressing issues, trends, synergies, and challenges to ideate achievable and lasting solutions for one of the world’s more critical sustainability concerns: WATER. Policymakers, Industry movers, Business leaders, NGO Professionals and Academia will be brought together in a dynamic moderated forum to discuss the more prevalent issues involving Water as it relates to: Scarcity and Wastage, Energy, Agriculture, Infrastructure, and Public Health. Scarcity and wastage: According to National Geographic, “fourteen of the world’s 20 megacities are now experiencing water scarcity or drought conditions.” If we are to ensure availability of water for all by 2030 (UN SDG 6), what are the causes of water scarcity, and who are the most vulnerable? On the other hand, how can we eliminate waste from production of materials to consumption? Hear from government agencies, utility companies, and development authorities as they strategize beyond the promise of “water for all” to a reality of sustainable water management in the 21st century. Energy (Big Industry, Renewables, Watershed): Water is a powerful force. It can shape the earth, transport people and materials, and even power electrical grids. As humans increasingly turn to water as a renewable resource, we must also remember its cyclical nature. How can we optimize the water-energy nexus without damaging watersheds and affecting ecosystems? Engage with diverse stakeholders from the electric and mining industries as well as the resource management sector on the growing role of water in sustainable energy, using the natural water cycle as inspiration. Agriculture (Farming, Agroforestry, Seafood): Food and water have been inseparable for millennia. With the dawn of climate change and extreme droughts, the environmental aspects of food security are more apparent than ever before. How can we retool farming and fishing practices to sustain our natural environments? Better yet, how can we integrate conservation efforts with opportunities throughout the agricultural value chain? Join leaders in agripreneurship, aquaculture, food and beverage, and forest conservation as they dive into the possibilities of water and agriculture. Infrastructure (Distribution & Consumption, Urban Development): Technology, economics, urban development, and sustainable communities: can we make our water systems work for future generations? From irrigation to refill stations, how can we rethink infrastructure in ways that will sync with water sources and provide better standards of living? Tap into the minds of leaders in development, utilities, and finance as they merge strategies to build better rather than bigger. Public Health (Waste Issues): While water is a source of life, it can also be a vehicle of disease and destruction. Especially in the Philippines, lack of proper hygiene and sanitation systems combined with an increase of extreme weather patterns put millions of lives at risk. Luckily, possibilities for risk management exist in more industries and sectors than typically thought. The question is, what can different stakeholders do to unite and protect populations before illness and disaster strikes? Don’t miss the chance to identify crossroad opportunities in public health and water with representatives from the public, private, and NGO sectors. Cherrie Atilano, Founding Farmer and CEO, AGREA Agricultural System International, Inc. This event is presented by Enderun Colleges, in partnership with AGREA, Forest Foundation Philippines and the Department of Environment and Natural Resources – Environmental Management Bureau, ANC, CNN Philippines, Manila Bulletin, The Philippine Star, BusinessWorld, Business Mirror, Expat, INQUIRER.NET, Philippine Primer, Grid Magazine, WhenInManila.com and TheFortCity.com.